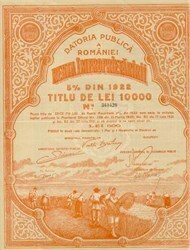 Beautifully engraved Certificate from the Romanian RENTA IMPROPRIETARIRII-DATORIA PUBLICA A ROMÂNIEI issued in 1922. This historic document is for the appropriation of land rent - Public debt, and is very decorative with a nice floral folclor frame with a reaping scene, peasants and the Romanian Kingdom coat of arms in the underprint. This item is over 77 years old and has 16 unused coupons not shown in the scanned image.